I like country, vintage, English and French country, a little Victorian, shabby chic, primitive, retro, rustic, pretty much everything but contemporary. I can't go minimalist and streamlined. My house was built in the 1950's and does not have an open floor plan so I think that I can get away with decorating each room in a little different style. Every room in my house has doors and some of them two doors! In the last few years I have found myself moving to a little Americana in our den. 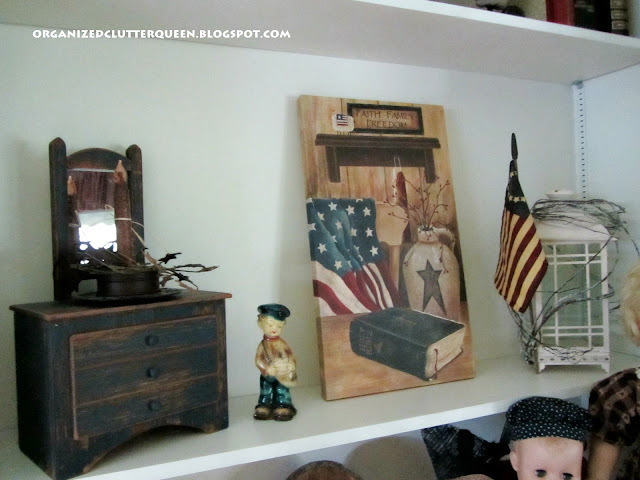 The den's primary colors are navy blue and red, and the decor consists of old gameboards, old toys (many of them mine as a child), crocks, and now the Americana. It's funny but just last week, I picked up a copy of Cottages and Bungalows, and it had a feature on old toys and Americana. At least one other house still has Americana! 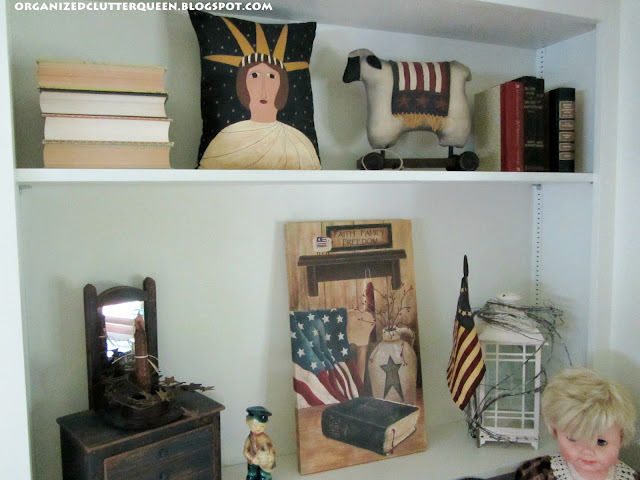 With the 4th of July approaching, I am going to share some Americana in my den. 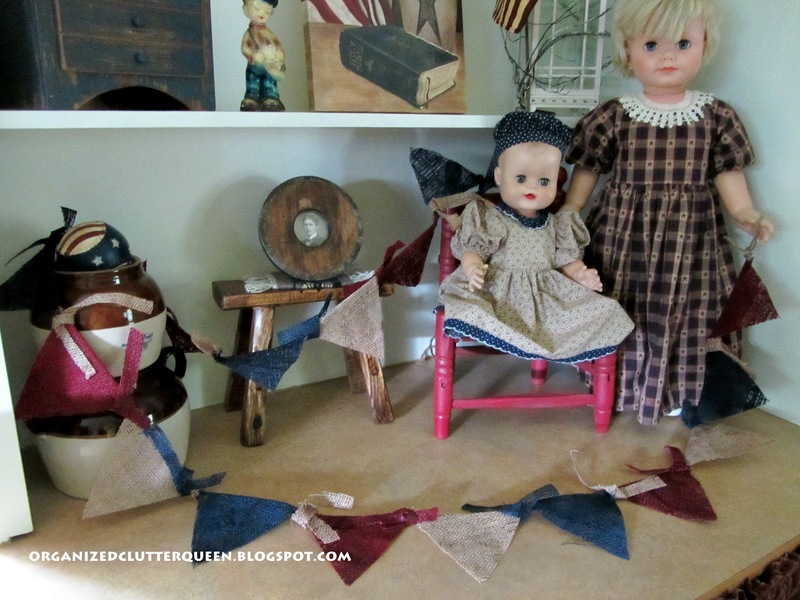 This vignette begins with my old childhood dolls. 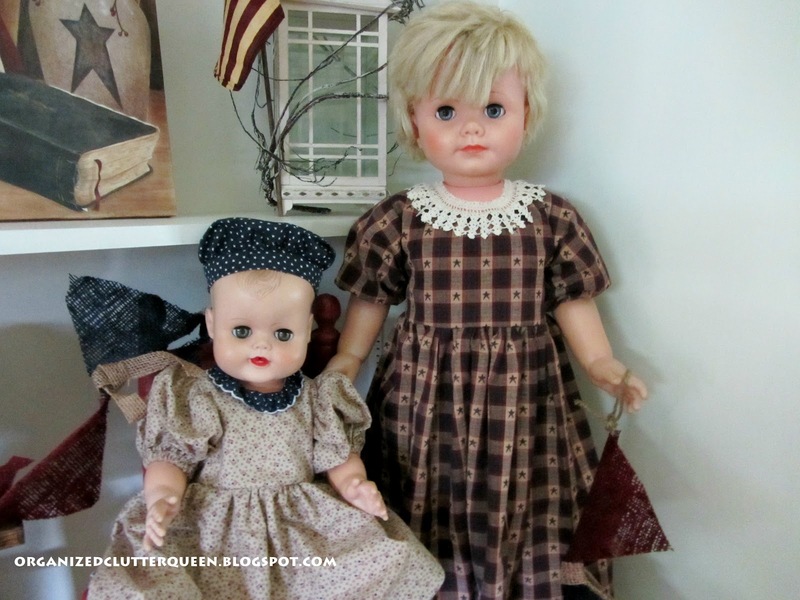 Here's Terri and a Wee Bonny Lassie, my childhood dolls featured in previous posts! You may not recognize them though, because they have new dresses. I had a friend of mine from a local shop, The Tattered Angel, make them new frocks! They don't look like they are in their fifties! This area is one side of my den's built in bookcases. Do you remember this little Robia Ware chalkware postman figurine that was my Grandma's? 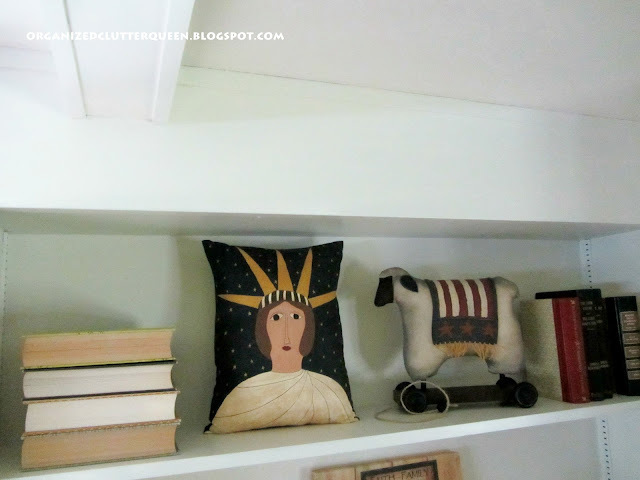 The canvas, Miss Liberty pillow and sheep are from the Tattered Angel too! I LOVE your little ladies! They were my childhood friends too and I'm so pleased to see your have dressed them for the occasion! I LOVE the old chalkware and my Mom has a set of BAND Musicians just like your little postman. LOVE HIM! Your setting is SO WONDERFUL. I love the idea too of being able to use different styles in different rooms. WHATEVER you do, "It should make YOU happy" to be there. I don't believe in magazines telling me WHAT'S IN. I want my home to be warm and when I walk in "You KNOW it's home because it's YOUR COMFORT ZONE"! Your display is so charming and perfect for the patriotic holiday soon approaching. Your dolls are adorable in their new dresses! It was tradition that we got a new summer outfit for the 4th of July when I was growing up. It was the biggest celebration of the year in our small town. 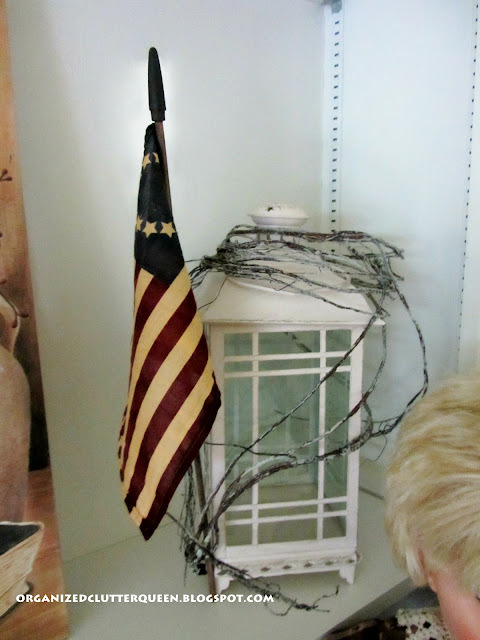 It's the perfect decor for the 4th of July. 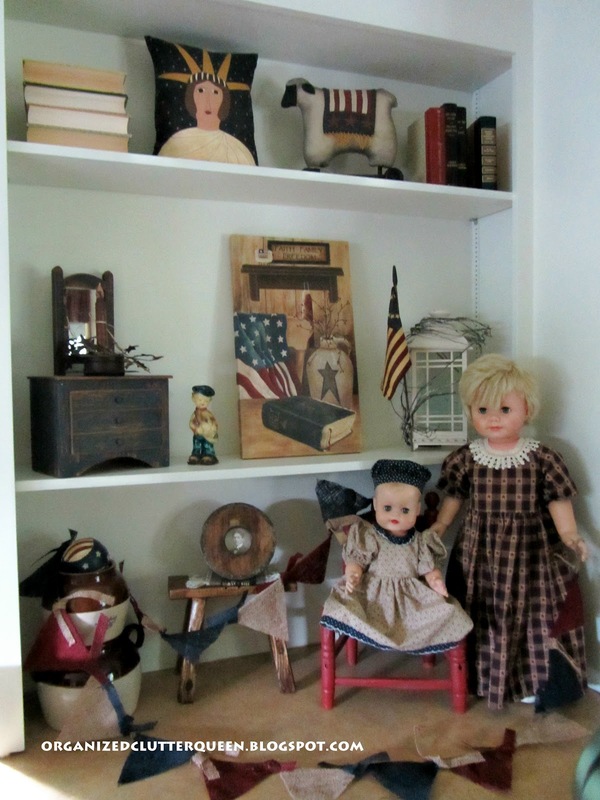 Love the idea that you have taken such good care of your dolls. Love the dolls and banner. It's nice that you have separate rooms. My house is so open and I really don't have doors or walls except for very long ones. You have so many beautiful rooms in your house. Oh my Debby, do you watch HGTV? Everyone wants open floor plan according to them! 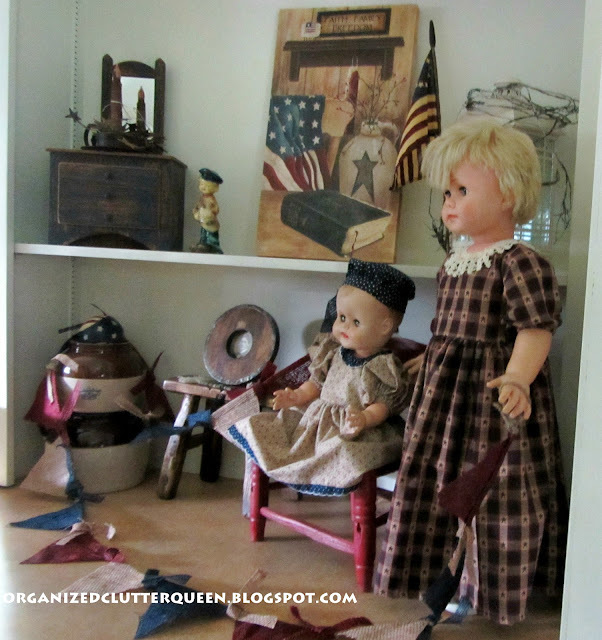 I love of all your dolls and Americana pieces. Who cares what's "in" and what's "out." You have a lovely collection that you definitely enjoy. Works for me! How wonderful that you have your childhood sweethearts still with you. they look adorable with the new dresses! thanks so much for linking up to the party! LOL I wish someone had kept my old toys. I was visiting a local antique store a few years back and there was my little barn ( a little tin barn set that I had at around 3 or 4 years old ) HA they wanted a fortune for it! 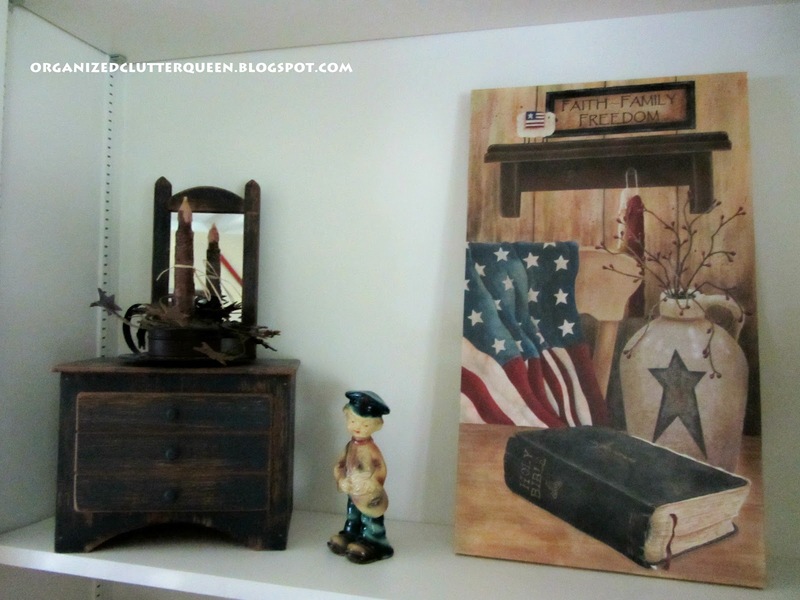 You have some wonderful Americana pieces! Love the canvas. Thank you for sharing at TTF and have a great day! I have nothing from my childhood...beginning to wonder if I had one!? Anyway, I was such a Tomboy I ditched any dolls anyone gave me but I did have a metal garage with a working windup and down car elevator. I remember playing with that for hours! Americana....sounds good to me! I love your display of it!